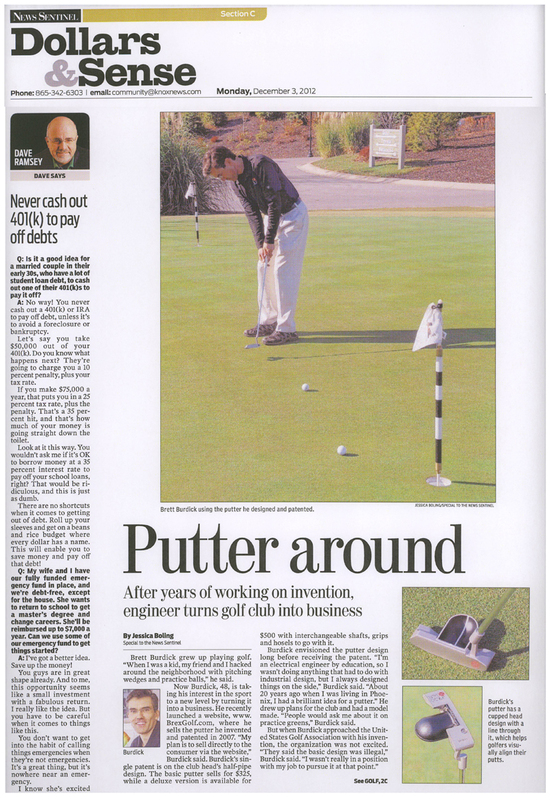 The Knoxville News Sentinel newspaper featured (as in, most of the page) Brex Golf and Brett Burdick in the Dollars and Sense section of today’s paper. Writer Jessica Boling did a great job of capturing the work that has gone into designing and building the Model BG-1 putter and the features that make it unique and perform so well. During the interview at a local coffee shop, a patron interrupted the interview to look at the putter more closely and take it over to his buddy to show it to him. That clearly wouldn’t have been the case if it was just another putter leaning against the table. We’re excited about the attention this has already brought to our company and are looking forward to taking care of our customers.